CODY, Wyo. – Heading into the 2018 Bullfighters Only Wrangler Bullfight Tour stop at the Cody Stampede, Kris Furr is experiencing a nearly euphoric case of confidence. He is fresh off a victory at the BFO event this past week at the Reno (Nev.) Rodeo, where he posted an 89.5-point fight in the Hooey Championship Round to claim the crown. Furr sits second in the Pendleton Whisky World Standings and moves a step closer to catching leader Toby Inman. The animal is a major part of the equation. With scores based on a 100-point scale, half comes from the animal’s aggression and ability to stay hooked on to the fighter; the other half comes from the bullfighter’s ability to remain close while maneuvering around, and over the bull. That’s why Furr’s fight last week was so measurable. Furr pocketed $6,000 in Reno and trails Inman by less than $5,000 heading into a major run of rodeos that are part of the BFO’s Wrangler Bullfight Tour. 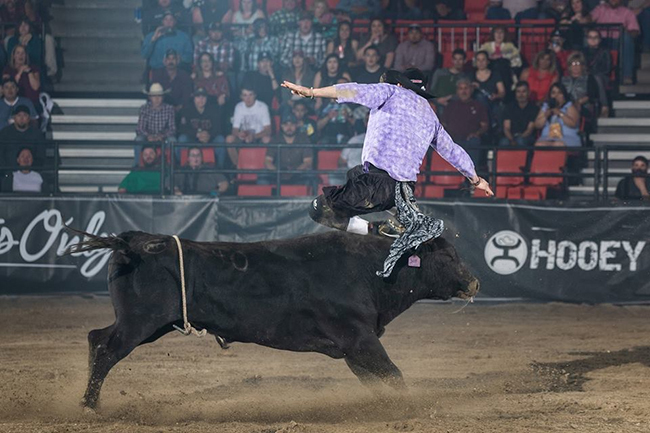 He bested two-time reigning champion Weston Rutkowski for the Reno title, but both men put on spectacular fights. Sid Vicious is owned by Manuel Costa, and the animal was named the BFO Bull of the Year in 2017. He proved it in the final few seconds of the bout by hooking the champ. Rutkowski sits No. 3 in the standings, more than $10,000 behind Inman. He’ll have a good chance to add to it Saturday night in Cody. He was the runner-up in 2016 and won the title last year. “Cody’s a place I love to come to,” said Rutkowski of Haskell, Texas. “The stands are packed, and it’s a great rodeo with a great event. The bulls always fight good there. Last year it kicked off my summer run, which was big in winning the world championship again.